Do you want to build an Armalite AR-10 Rifle? So you decided you want to build an AR-10 and your internet search delivered you to this site 308AR.com and that’s a great start. The problem is years of misinformation from word of mouth, published media and now the internet has steered many shooters down the wrong path in both purchasing rifles and building their own from parts bought online. To clear this up and educate visitors we will start with a brief little historical information and some misconceptions. 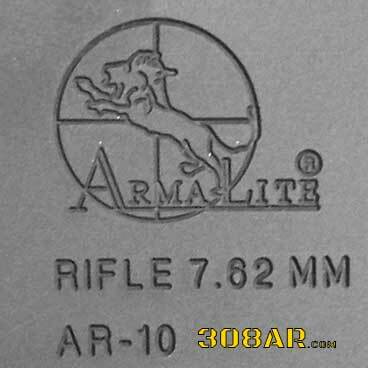 The AR-10 is a trademarked model designation of a rifle model from ARMALITE. No other large frame AR in .308 should be referred to as an AR-10. This is the reason I started referring to other branded weapons as 308 AR Rifles (AR308). Inevitably I get email and negative comments on the subject but here’s why I stick to my guns in using proper naming. That reason is compatibility. These large AR rifles do not share the same interchangeability as their AR-15 counterparts and that is very important. I like to use analogies when this subject comes up. All muscle cars are not Mustangs, all bolt action rifles are not model 700’s and all Cola’s are not Coke. ARMALITE is the ONLY AR-10. If you want to build an AR-10 head over to Armalite and order an authentic AR-10 UPPER RECEIVER/AR-10 LOWER RECEIVER. I promise you it is the only lower receiver stamped AR-10. There is no Mil-Spec AR-10 or 308AR. Any marketing material stating otherwise is misleading. What can be made Mil-Spec is materials and finishes. Dimensionally there is no MIL-SPEC with regards to parts. The interchangeability and that’s where the confusion of the platform comes in to play. The 308AR platform is full of inconsistency and a lack of interoperability. Armalite itself has two different styles of AR-10, DPMS has multiple receiver heights on their LR-308 rifles, the DPMS SASS has a proprietary barrel and gas system. Then there’s the DPMS G2 which is an entirely new platform all together. Rock River Arms, POF , all more different than the rest. 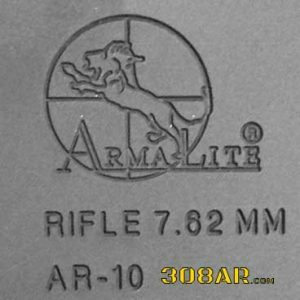 Once again if you want to build an AR-10 visit Armalite. If you want to build a 308AR and have some flexibility look towards companies like Aero Precision and Mega Arms as solid bases to begin a 308AR build. Their hardware is first rate and very generic in the way you want it. Of course there is other equally suitable brands but you need to do your homework in advance. There is a misconception that the AR-10 is based on the AR-15. This is completely false. First off AR in AR-10 and AR-15 stands for “ARMALITE RIFLE” and not assault rifle. The AR-10 was developed by Eugene Stoner in 1956. The AR-10 was re-scaled one year later and became the AR-15. DO YOU STILL WANT TO BUILD AN AR-10? DO YOU STILL WANT TO BUILD AN AR-10 or would you prefer to build a 308AR? If you still want to build an AR-10 I suggest buying a complete rifle directly from the Armalite. 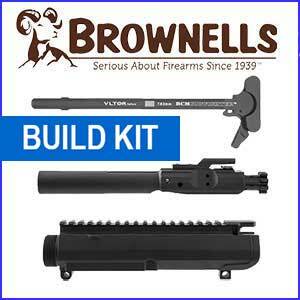 Building an Armalite AR-10 from parts will be a costly endeavor with no benefit over purchasing a rifle from Armalite. If you now realize and understand you want to build a 308AR by all means browse the pages of this website and have at it. The experience is quite rewarding. I suggest visiting the following links before you proceed.